Most investors say investment performance and trustworthiness are the two most important characteristics of a financial planner. Performance should be easy to monitor if your financial planner or financial advisor provides a quarterly investment performance report. Trustworthiness is much tougher to check because there is no quarterly report. So how do you determine if you are getting ethical advice from your financial planner? Ethics are a critical part of your relationship with a financial planner. That is because you believe the planner is a financial expert, whether it is true or not, so he is in a position to influence or control your financial decisions. If the planner is ethical you will receive advice that is in your best interests. If the planner is unethical you will receive advice that makes the planner the most money. What is a Compliance Record? The only way to measure a financial planner’s ethics is to use FINRA.org’s BrokerCheck service to check his compliance record. This website reports investor complaints, company complaints, and actions by regulatory agencies. There is a better chance the planner is ethical if he has a clean compliance record. But, it is no guarantee. Ethical planners may provide unethical advice if the incentive is big enough. What About Current Licenses & Registrations? You cannot assume an advisor is ethical just because he has current industry licenses and registrations. Bernie Madoff had current licenses and registrations up to the day he turned himself in. If investors took a few minutes to check his FINRA compliance record they would have seen numerous complaints. However, the complaints were not flagrant enough to yank his licenses. You can compensate financial planners with fees and commissions. The most ethical planners charge fees for their knowledge, advice, and services, just like other professionals (CPAs, attorneys). Planners, who are really salesmen, are compensated with commissions by third parties. Planners who work for commissions have more potential conflicts of interest than planners who work for fees. 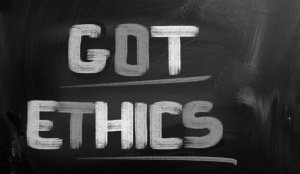 Ethical advisors practice full disclosure for their credentials, ethics, business practices, compensation, and other pertinent information that impacts their qualifications and trustworthiness. That is because they have nothing to hide. They do not withhold information from you that may cause you to reject their recommendations or terminate your relationship with them. Less ethical financial planners withhold information because they have a lot to hide. Ethical financial planners are willing to document the information they provide you. Unethical planners prefer verbal information so you have no written record of what was said to you. If there is a future dispute it is your word against theirs and they will win because you have no evidence.